Few visitors travel beyond the popular neighbouring islands of Lombok and Bali, but voyage a little eastwards and Sumbawa Island offers a peaceful escape from developed tourism areas. Lesser-known West Sumbawa reveals hidden coves, deserted beaches, and remote traditional villages with people living close to the land. Traditional villages perched high in the mountains provide perfect vantage points for soaking in dramatic sunsets and the stunning coastline. Sumbawa is a sprawling island with vast tracks of jagged peninsulas, volcanic mountains and idyllic, powdery white beaches, perfect for swimming. Sumbawa is like two islands, divided by geography and language: Sumbawa in the West (Samawa ethnic group) and Bima (Mbojo ethnic group) to the East. The island has historical links with the Makassarese people of South Sulawesi and the Chinese who traded in these waters for hundreds of years. 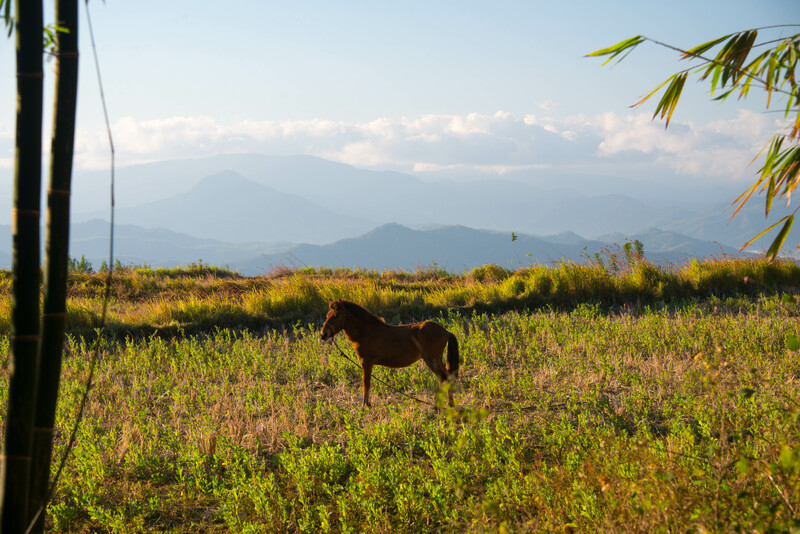 Around 85 percent of Sumbawa’s terrain is mountainous. The plains yield prosperous crops and excellent returns to farmers who have long enjoyed the benefits of the fertile volcanic soil, enriched by the dramatic eruption of Mount Tambora in 1815. The Guinness Book of World Records describes this event as “the biggest volcanic eruption in modern history”. The top third of the mountain was blown off and over 150 cubic kilometres of rock and ash was showered across the valley. Tambora belongs to two regencies; Bima and Dompu. The best way to get there is flying to Bima airport, and then driving to Pancasila village or Calabai village in the Dompu Regency. You then overnight in Calabai or Pancasila village, and begin your trekking to Mount Tambora. There are three route options. It is necessary to plan all aspects of the trek in advance, and allow two days and one night from Pancasila or Calabai village. The walk is for experienced climbers only and has its challenges. You must be physically fit and prepared for some discomfort and dangers. You will slash your way through virgin forest as the trail is not well worn, and, in fact, in 2009 only three groups climbed the mountain. Since records have been kept (2004), only 50 people per year have made the trek to the summit. The most powerful volcanic explosion of all time reduced the height of the mountain from 4,200 metres to 2,800 metres, and the sound of the explosion reached as far as Jakarta. This is a climbing adventure for the brave at heart. Surfers from all around the world come here to surf the infamous left-hander, which can be surfed on any tide. Travelling around Sumbawa can be a bit on the fly, as many smaller hotels do not have reliable phone or internet connection. Travelling with a guide who has reliable contacts and local knowledge makes independent travel a whole lot easier. We found a lovely little villa right on Jelenga Beach (located about 1.5 hours from Poto Tano). Scar Reef Beachfront Hotel has a gorgeous tropical garden that spills out onto a serene white sandy beach. The rooms are spacious and well appointed. There was not another soul on the beach when we arrived, and this did not change for three days. I instantly found a hammock strung across a beach bale and settled in for a few days of swimming in the pristine warm waters. The only other people staying were surfers, who went out very early each morning, and were not seen again till late in the afternoon. The peace and quiet was just heavenly. Jelenga Township is internet challenged, so one must be inventive if requiring communication with the outside world. This involved jumping on the back of one of the staff’s motorbikes after dinner and heading up to a nearby hill to get 3G reception, where even the local doctor was chatting to his girlfriend on the phone. You know you are far from tourism when you have experiences like this. Sekongkang Beach is the most well-known surf spot, and nearby, Yoyo surf break attracts surfers from Australia to Hawaii. These beaches are located on the south-western part of West Sumbawa Regency and are a 35-minute drive from the nearest point of Maluk, or 1.5 hours from Taliwang. For non-surfers, be sure to check out Maluk, a lovely beach located an hour’s drive from Taliwang. It has the purest white sand and calm waters. Do not be surprised if you are the only one here. 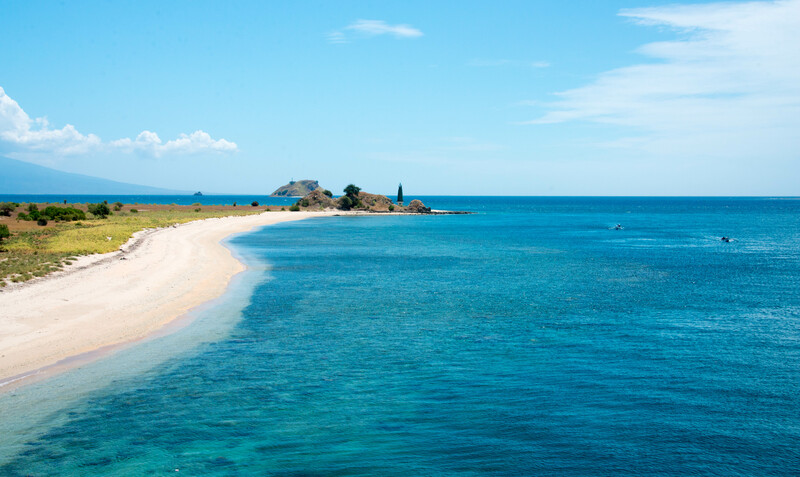 Exploring this West Sumbawa coastline is definitely worth a couple of days. There are many examples of smaller low-key resort style accommodation and low-impact tourism. Rantung Beach Hotel has 12 guest rooms with ensuites. The beachfront cafe serves fresh Indonesian and Western cuisine. With a fresh juice or icy cold beer in hand, this is the perfect place to watch the sunset. Guided spearfishing and snorkelling are offered here and a great way to finish the day is to throw your catch of the day on the barbeque and watch the stars appear above you. Room rates here start at only US$15 a night. Moyo Island is located in the north of Sumbawa. The travel distance from Sumbawa Harbour is approximately 1.5 hours (by wooden boat) or 40 minutes by speedboat, or you can fly there from Bali. A stunning, mountainous island, Moyo is covered mostly by protected forests. The dense forest is home to a plethora of wildlife including deer, wild boar, wild cattle, monkeys, and various types of birds. The island of Moyo claims to have some of the most beautiful waterfalls in Indonesia, made famous by a visit from the late Lady Diana. By Boat: Public ferry from Lombok to Sumbawa departs daily from Labuan Kayangan (East Lombok) to Poto Tano (West Sumbawa). Travel time is two hours. Poto Tano: The harbour port town for ferries to and from Lombok. Seran Village: Located 10km from Poto Tano, this is the location of a 1,000-year-old cemetery. Mantar Village: Accessible by 4Wd – 1 hour from Poto Tano.